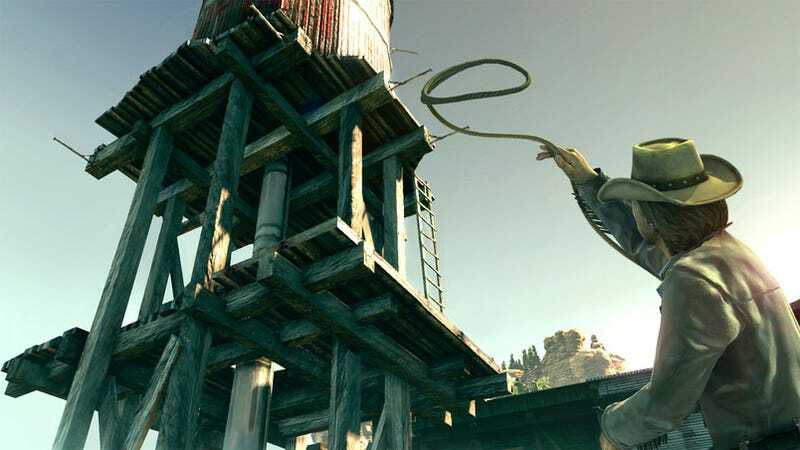 Ubisoft today released the first trailer and game details for their upcoming western-shooter Call of Juarez: Bound in Blood, due out this summer on the PC, Playstation 3 and Xbox 360. The game, in development by Techland, will tell the story of the McCall brothers and take place in a variety of settings from "a ravaged Civil War-era Georgia to the Aztec ruins of Mexico." The game will let you use a variety of weapons including canons and machine guns and includes shooting modes that can be unlocked with high accuracy percentage during shoot-outs. Bound in Blood supports coop play, with gamers taking on the role of either Ray or Thomas MCall, each with their own gameplay style, specific abilities and weapons. The two characters specialize in close or long range fighting, can use lassos, dynamite and duel-wield. The game will have the McCall brothers face a renegade Apache Chief, a greedy Mexican bandit, a vindictive Colonel, and others. It also will let players use horses, canoes, and wagons. Finally, Bound in Blood's multiplayer will include multiple modes and maps. Multiple characters are unlocked for team-based objective modes or the straightforward team death match. A Bounty system allows players increase the bounty on their head with more kills. Getting rid of the deadliest among the players increase your bank roll. Sounds like this game has oodles of potential.